The Feed In Tariff ((FIT, FiT, standard offer contract, advanced renewable tariff, or renewable energy payments) scheme is a government programme designed to promote the uptake of small-scale renewable and low-carbon electricity generation technologies. 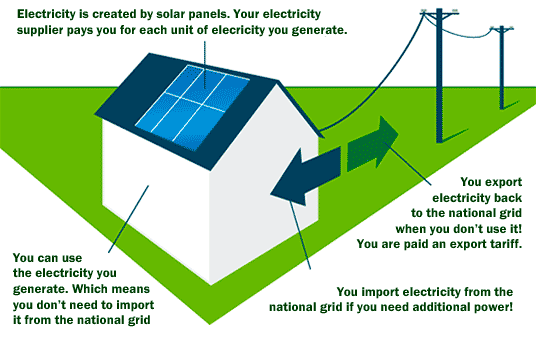 Introduced on 1 April 2010, the Feed In Tariff scheme requires participating licensed electricity suppliers to make payments on both generation and export from eligible installations. How does the Feed In Tariff scheme work? The generation and export tariff rates you will receive are dependent on a number of factors. For more information please see our application page. You can also find our latest tariff tables on our website. You will then receive Feed In Tariff payments from your FIT licensee from the eligibility date of your installation. You’ll continue to receive payments for the duration of the eligibility period. Anything Else I Need To Know About The Feed In Tariff Scheme ? More information on the Feed-in Tariff scheme can be found on the Ofgem Website.